On October 31 of every year, children around the nation enjoy carving jack-o-lanterns, dressing up in their favorite costumes and going out trick-or-treating for candy and treats.Although the traditions of Halloween have been longstanding, it is important that both parents and children approach the occasion with a combination of diligence, forethought and safety in mind. When children choose a Halloween costume, they think more about the style and character than the actual safety aspect.It’s important that any mask be designed in such a way that does not obstruct the child’s view while being worn.In addition, a costume should be comfortable and not restrict movement or increase the risk of the child stumbling or falling.Therefore, the costume’s length must also be considered.Bright colors also are recommended so they can be easily seen. In a perfect world, it would be safe for children to go out and enjoy Halloween by trick-or-treating in the nearby area or neighborhood.However, this is not a perfect world and it’s important that an adult accompany children who are outdoors and/or trick-or-treating.Ideally, there should be one adult for every 2-3 children.This is especially important in large groups, where it may take more than one adult to supervise multiple children at once. Because trick-or-treating typically occurs in the evening hours, it’s important to have a working flashlight on hand.Add fresh batteries to ensure it will last through the night.Adults should carry their cell phone in case of car trouble or to reach emergency contacts, if needed. 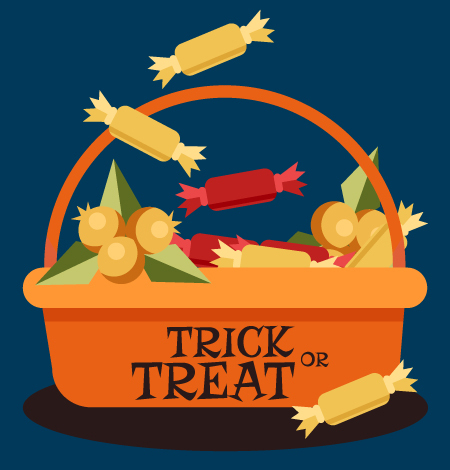 When trick-or-treating, always remain in well-lit areas.This includes areas with working street lights and homes that have a porch light turned on, which is a sign that the homeowner(s) welcomes trick-or-treaters.If the house is dark and/or the porch light is off, avoid the home and continue on to the next one. One of the greatest attractions of Halloween to a child is that of trick-or-treating and the prospect of receiving candy and other treats.It’s important that both parents and children know which types of candy are safe and which are not.Candy that is unwrapped or is not factory sealed should not be eaten.Instead, it should be thrown away.In addition, candy with expiration dates that have passed or anything that’s homemade should be discarded.With this in mind, it is recommended that nothing is eaten until parents and children examine all of the “loot” once everyone gets home. Trick-or-treating is typically designated at a certain time for every area.This means that some towns may allow trick-or-treating on the night before or the night of Halloween.Additionally, there are specific hours and age limits that must be observed by all who choose to trick-or-treat.It’s important that both children and adults understand the local rules and adhere to them strictly.If you are concerned about missing the curfew, wear a watch that lights up with the touch of a button.This will allow you to easily see your watch face in the dark and will ensure that everyone gets home on time.